will it be the pizza or the sushi for you, ma’am?! if you know anything and me and the husband, you’ll know that we are quite different. i’m a “let’s try to please everyone” kind of person while the husband is more of a “let’s do what’s good for us” kind of guy. you want to eat dinner at 8:30 instead of 7? that’s cool by me. might not be my first choice, but i don’t care. i like to eat. doesn’t matter when. you want to see the new Brad Pitt instead of the new Indie? that’s cool by me. again, not my first choice, but i don’t care. It’s just for me, at the end of the day, i’m happy to be with my friends. i’d rather not speak up and go with the flow. it’s how i am, it’s how i’ll always be. now, i’ll tell you right up front that neither one of these ways is ideal. there has to be some sort of balance between always compromising and not compromising at all. we just haven’t found it yet. this morning i took Emily to the husband’s cousin’s bat mitzvah party. it was all-girls’ pizza and scrapbooking party. a far cry from the dinner-and-dance-catered-with-a-band bat-mitzvah that my Emily will likely have, but it was nice. and Emily had a blast. tonight we are planning to hang out with our friends (another 2 couples in that friends-for-life category) and they called to say they were serving pizza. now, my husband, who was looking out for me, and who had the best intentions, asked if there were any other choices, since i had said i would prefer not to have pizza for the second meal in a row. now, i don’t know if i should have, since sometimes i get angry inappropriately. but i was upset because if anyone had asked me, i would have said that pizza was fine. yes, not my first choice, not by a long shot. but, if it was going to make everyone else in the equation happy, i was certainly more than willing to go along with it. not my first choice…but i like pizza….i’m sure i would enjoy it. so, i said, not-so-politely, that if they now changed their minds for me and ordered something else, i would be really upset. putting the husband in a catch-22. he’s damned if he does and he’s damned if he doesn’t. i just don’t like the idea that if this was the plan…that they changed it for me. “oh…we have to have sushi because of Ali”. “Ali didn’t want pizza so we are stuck paying an arm and a leg for sushi…and i don’t even like sushi”. see…these are the reactions i don’t want. there are 5 other people eating…why should they change their plans for me? am i completely and totally off my rocker…or are there other people out there who can commiserate with me?? nowÃ‚Â the husband’s upset with me. he’s all huffy and non-verbal…which is his fighting style. mine, my friends, is not. i don’t stop talking when i’m mad at him, i start yelling (a curse that i inherited from my mother) and i was to fight it out. not ignore each other and act like babies. also…my kid is obsessed with blackberries. she is constantly on the phone “hi Noah!” the bow is there just because i got it to stay. i didn’t go as far as Anna and use Karo syrup to make it stick…but i’m getting quite annoyed with people who think she’s a boy. especially when she wears all pink. I am like you. I will go with the majority to avoid rocking the boat. I am also like you in the way I argue. I don’t ignore…I try to talk. When that doesn’t work, I yell. Does it solve anything? Not usually. But, I work off a boatload of steam AND take a moronic satisfaction knowing I shattered his ear drums!! Phew…if you ever shaved your head, I’d know you were absolutely certifiably insane. I mean, Brit has weaves, so, it might be good to start over…. But, not you. I can’t stop thinking about pizza now…. Mmmmm….I hope you’re not sleeping on the couch tonight…. Let’s hope he starts talking. My ex was a nonverbal fighter, I’d get so mad…start yelling for him to talk and asking if someone cut off his tongue! And PLEASE, don’t cut off the hair! Well, I am not a go with the flower, but I am not a have to have it my way person either. If you asked my family they would probably say that I am the latter. I just state my opinion. I would have done the same thing as you though. I’ll back you up girl! Awkward. I hope it works out…. We are just too much alike. 🙂 I hate for anyone to change their plans for me. I will pretty much go along with anything, if it suits everyone else. On the other hand if Spence knows I don’t like something, he will just come out and say “mandi doesn’t like that” which makes me feel like a total tool. I yell too and want to talk about everything. Get it all out. Spence will just walk away or say he has nothing to say…which I hate. Whether or not I assert myself depends on who I’m with. There’s no rhyme or reason to my choices, it’s just the way I am. To make it worse I’m a libra. I constantly ride the fence. You are NOT off your rocker. I sooooooooo get this. I am the exact same way. You could have lived with pizza but I would have been mortified if someone spoke on my behalf and caused someone else to make special stuff when it wasn’t a big deal. I so get this. He was just looking out for you. But I understand about the ‘going with the flow’. Why make 5 people eat something else when you were the only one who didn’t want pizza but didn’t care? Did you wind up eating pizza? I hope you work it out! I’m just like you. I’d rather the majority be happy than have everyone change for me. But then again, I don’t like having attention thrown upon myself, so maybe that’s part of the problem too. I love that big fat bow! Ha! Gorj. 😉 And, yeah, that was SO cool of your friends…. Hmm, I’m more of the “I want it my way” sometimes and then “let’s compromise” the other times. I think it depends on the situation. Sushi sounds so good right about now! But not for another year or so. Boo hoo for me! 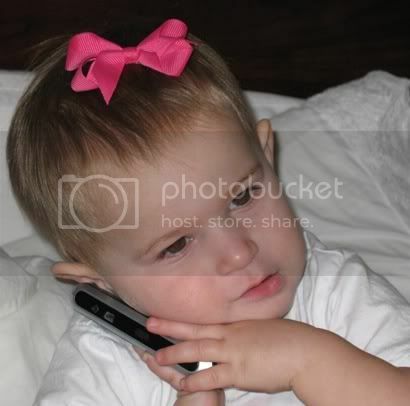 Oh she reminds me of my friends daughter…she is so taken with my pink Razr phone that she has foresaken calling me “Di” and now greets me with “phone”! If I don’t respond, she questions, “Toby?” looking for my dog! People thought that I was a boy with my ears pierced and wearing a pink dress so my mom says. People are just ignorant I think. She DEF. looks like a girl even withOUT the bow. I’m glad things resolved nicely – my husband is the opposite of yours and never stands up for me (he’s shy), which makes me mad sometimes. That drives me nuts when people see my completely pink-clad, dress-wearing toddler out and they PRESUME SHE’S A BOY.